At the same time, I wanted to read Voyage of the Dawn Treader and I did so early on before this Chronicles of Narnia Reading challenge began. One of the things I've been gleaning from Proverbs this time reading through is who we are to seek fellowship with as Christians. As I read through Voyage I was struck by Lewis' tale of personalities colliding and striving against and with each other. I saw so many lessons from Proverbs sprinkled throughout the Voyage's ultimate quest and journey through the various Islands and I decided I'd kinda of like to use this commentary in conjunction with the Narnia Reading Challenge. That's the plan at any rate. It is published by Concordia Publishing House so right off the bat I know it's Lutheran. It is written by Andrew E. Steinmann who is currently the Professor of Theology and Hebrew at Concordia University Chicago. I know I'm not going to agree with him in every particular, but we're going to share a lot of similarities. The author explains in his preface that writing a commentary is an enormous task and that he is not sure that he wrote the best quality. He explains, "Attempting to comment on the wisdom of Proverbs is a humbling work for anyone who takes the Word of God seriously. Never does one feel quite up to the task." I kind of feel that way and I'm only writing a book blogger's review! So I'm going to say this: I'm a housewife, a mom, a Christian who wants to know her God better. I'm one who wants to learn to walk in wisdom and grace. My goal in utilizing this commentary is to grow in faith and understanding. I pray that will happen. I'll be referencing this Proverbs commentary throughout the month in a series of posts I have planned for my trek with Voyage of the Dawn Treader. Why this book and why this jointed study? Because I cannot grow in my faith without being fed the solid, undefiled Word of God. And I learn best through stories. For me, I'd like to take a month out of the summer to enjoy a good story alongside some instruction on the wisdom of God. So here goes - for better or worse. I'm just kind of stumbling my way along and am exposing myself during the journey. I can't really say that I'm relishing this because this is my first attempt to do anything like this at all. I'm likely to fall flat on my face and don't really trust my abilities. But I'm going to try. Why? Because I want to learn. And while I do tend to learn by and from reading stories - sometimes I also learning by trying and failing. I can't wait to read what you learn through this experiment! Great idea! This is a fabulous idea! I would love to take this journey someday. 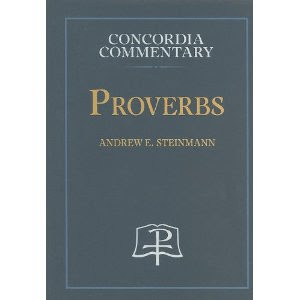 I'm really excited to hear what you have to say about this Proverbs commentary! It sounds really interesting. Proverbs is a fascinating book.